Had a test today and stumbled onto a good test taking strategy. No, this doesn’t just come from a one time occurrence, but from a realization of things I’d learned a couple years ago. This will work best with short answer questions, where the answer isn’t right in front of you, but you have to search your mind for it. Obviously, you want to have studied well, but specifically you need to read through all the notes you have as thoroughly, but quickly as possible. This is step one. Just take as much time as you have, an hour or two tops, and get through the notes at least once, maybe twice. This does not replace your general studying, but is for review, to keep the material is fresh. Then, when you sit down to the test or get to the short answer portion go through it relatively quickly. The first time through spend no more than 20-30 seconds thinking about the answer or trying to remember. If you remember it, good, then write it down. But if you are having difficulty, then after about 20-30 seconds skip it, and move on. Go through the entire short answer portion or exam like this. Once you have come to the end, go back to the beginning and go through it again. What you will find is that for many of the questions you couldn’t remember before, you will more easily remember what the answer is, and quicker. What happens is that while you are continuing with your test, your mind is still trying to find what you were looking for. And by going through the exam, other questions may remind you of the answer. So when you get back to the question, your mind has done the searching while you were working. This applies to life in general as well. If you are trying to remember something, go back to whatever you have from that situation, anything that was present, especially something significant to the situation. Often when people forget what they were going to say, I start telling them what we were just talking about in the minutes leading up to it, and they remember. If nothing seems to trigger the memory, then move on, and come back to it later. Your mind will continue to search for what you were trying to remember. For more on how your memory works and how to make it work better read Mega Memory by Kevin Trudeau. Hope this helps people. God Bless. I’m still a little on my productivity kick from going through the 4-Hour Workweek, so here’s my productivity tool of the week (don’t know how long this will last). Evernote is a great tool that can help compile your thoughts and ideas in a safe and secure place. Everyone should know that when you get an idea that you want to remember then you should write it down immediately. But not everyone has a pen and paper available all the time. Evernote is simple, and can be accessed from any computer with internet access, or almost any smartphone. Simply log onto your account, open whatever notebook you want to add your note to, and write it out. The benefits of using Evernote include being able to organize your notes into categories (called notebooks). For example I have a notebook called American Resurgence Blogs where I write down anything I want to remember about blog posts and ideas. You can also store images on Evernote, like things you see that you want to buy. Simply take a picture on your smartphone, and send it to Evernote. Evernote is also searchable. After you’ve been using it for a while you will probably have quite a collection of notes. It might end up being more difficult to find what you’re looking for. In the top-right part of the screen you can enter into the search bar what you are looking for and it will search through your notes and bring any of them that contain what you’re looking for to the front of your screen. This is just a sample of the benefits of using a program like Evernote. It can be very organized, and can be accessed from any computer in the world with internet access. It is a very useful tool for remembering idea that comes your way. Speedreading is a skill than many seek, but few acquire. The ability to consume large amounts of information very quickly is something I’ve striven for for years. I have made some good progress too. When I was about 14 I started researching speedreading and found my current speed was about 120 words per minute (wpm). After now 8 years and a number of different programs and books I have made some good progress. I’m no where near the 1000+wpm that many programs claim, but I have gone from 120 wpm, to about 300 wpm. Now it takes me about 20-25 minutes to read 20 pages of a book, instead of an hour+. I call that a win. I recently downloaded another program for my iPhone that I believe is the most effective method I’ve tried to date. 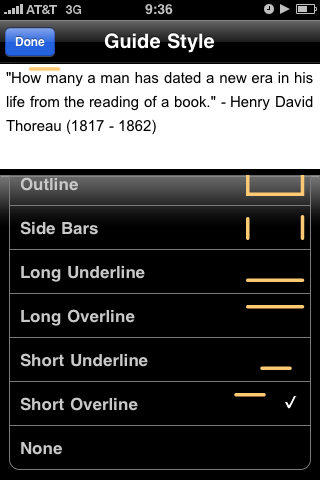 It’s called Quickreader. In the last week I’ve gone from about 300 wpm to 380 wpm. For one week that’s pretty good. It only cost me $4.99 and came with 28 complete books. This is how I have made it most effective for me. Compiling some of what I’ve read in other books on speed reading, I came up with a drills that takes ten minutes per day and is extremely effective. After you’ve established your starting speed, subtract about 20-30 and that is the starting speed of your training. So if you tested yourself and were clocked at 250 wpm, then you will start your training at about 220 wpm. Use some sort of timer, and use the guided reading for one minute. Once your minute is up, take one minute to rest your eyes, and increase your speed by 10% of your clocked speed, rounded down to the nearest 5, in this case 25 wpm. So your second round speed will be 245 wpm. Go through another reading session of one minute, starting at the same starting point as round one. Sta rting at the same point and reading the same text over and over helps your body build confidence in reading faster. You will repeat for a total of five, one minute sessions. So if you start with 220 wpm, you will finish with 320 wpm. What also makes this particular resource even better is the tracer that it uses to train your eyes. It offers a variety of different options (see right), but the best option, in my humble opinion, is the short overline. My reasoning is that it keeps your focus on the space above the text, which allows you to use your peripheral vision better, and ultimately absorb more text at one time. The second reason is that when using three stops per line or less, it forces you to start reading a line two to three words in and finish two to three words before the end. This helps minimize eye fixations, and maximize your words per minute. 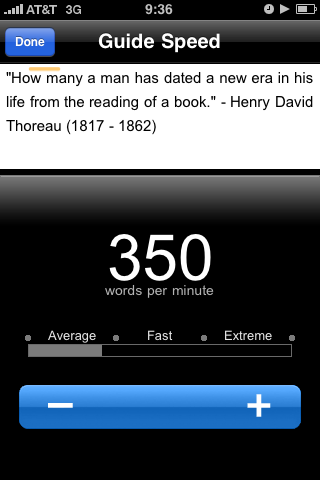 By setting my QuickReader up this way, and using it for ten minutes per day I’ve added 80 wpm in less than a week. I hope it helps you as it has helped me. God Bless. Back from a difficult few weeks. My dad passed away on December 22. Back on the productivity trip that I was on before. The tool I’m talking about today is called Text Reminders. 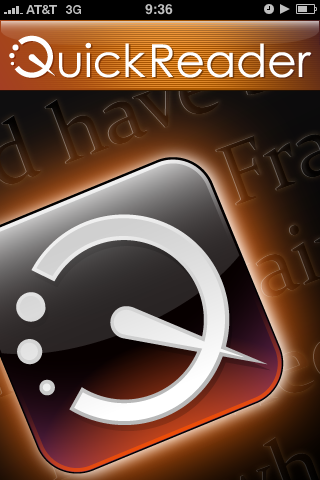 Text reminders is a free service that enables you to have preplanned text messages sent to you. You can remind yourself to do anything you want: check the mail, get on task, call so-and-so, etc. You basically write your reminder, tell it when you want to receive it, and it shows up at the appointed time. Great service in general. I have the following message sent to me: “Are you being productive, or just active?”. Four times per day I get that message and it helps me stay on task and keeps me from procrastinating or wasting time. Hope it helps you. Enjoy. I guess I’m on a productivity trip right now. Probably because I’m reading Tim Ferriss 4-Hour Workweek. This time I learned about a great new application. It’s called YouMail. Among other great features, the best feature is the Voicemail to Text feature. For only $3.99 a month you can get up to 50 voicemail messages sent to you through text. I don’t know about you, but I hate listening to voicemail, most of the time they could have sent a text anyways. Also, this way I can check voicemail in classes, or movies, or church, etc. without causing a disturbance. Check it out and see if its for you. When I talk about procrastination, I talk from years of experience. I’m the guy who will write a 5 page paper less than 24 hours before it’s due, even though I had the assignment for over 3 months. My wife still makes fun of me for getting her a moose ornament one Christmas (exchanging ornaments is a tradition we have) because I waited till the last minute (it had a nice little message on it, by the way). I’ve procrastinated just about everything, but now I’ve found something that helps me stay focused and get work done. Its called the Pomodoro Technique. It’s really simple to learn, but extremely effective if used. The idea is to have 25 minutes of focused work, then you get 5 minutes of break time. These numbers aren’t fixed, but they do work well for most people, the idea is your focused work should be significantly greater than your break time. To go along with this I found a free App you can download for your computer, which will help you stay on topic, and off Facebook and Twitter. Its called the Focus Booster. It is a simple countdown timer that always sits at the top of your screen, meaning it is never in the background, always in the front and visible no matter what screen you’re using. It can be set to almost any time periods and can be extremely effective. Here’s how to use it. I recommend using Parkinson’s Law along with it. Parkinson’s Law states “that a task will swell in importance and complexity in relation to the time allotted for its completion.” This means essentially that deadlines matter. Essentially if you give yourself a shorter deadline, say 25 minutes for a task, if you crack down on focus you can likely complete it in that time period. Obviously you can’t do everything this way, like rebuild a ’70 Camero in 40 minutes. But if you set a realistic, maybe a little short deadline, and crack down, you will get more completed in less time. I use the Focus Booster two ways. 1: I keep my ToDo list right next to me, set the timer for 25 minutes, and start hacking away. 2: I will set a time for a specific task, say 10 minutes to write a blog post, click start, and get it done. Simple as that, and yet enormously helpful. Try it, experiment with it, and post how you use it below for others to learn from. This is something no one should be without. Good luck, and God bless. 4-Hour Workweek for more on improving productivity and cutting back on work time. How Do You Spend the Currency Life? I was just reading a post from Timothy Ferriss’ 4-Hour Workweek Blog titled: On the Shortness of Life: An Introduction to Seneca. As I was reading this concept came to mind. There are basically three ways that you can spend your life, and my question to you is this: which one comprises the majority of your life? How much of your life is being invested? To invest your life means to spend time learning, or earning (for some that means both). It is a good thing to spend your time learning about your craft, or various crafts. For example I spend at least a few hours every week learning more about diet, nutrition, and exercise because that is my chosen career (I’m a Personal Trainer and Nutritionist). I also try to spend some time learning about my God, and how to be a good husband (getting married two weeks). I also spend probably 25-30 hours per week earning money and providing for my life and future spouse. How much of your life is being enjoyed? Life is meant to be enjoyed, not just lived and waded through. How much time do you spend with your friends, with your family, with your husband or wife? How much time do you spend doing the things you enjoy? This doesn’t mean that you can’t enjoy your work or investing in yourself, but you need time away where you have this thing called “Fun”. Fun is about relaxing, sitting back and enjoying the time and company of those around you. How much of your life is being wasted? This, for many people, is a far bigger piece of the pie than it should be. Many times that wasted time can be thought of as necessary, but it almost never is. For example, what do you do while in your commute to work? Many people commute to work, 20 minutes, some an hour or two. What are you doing during your commute. There are many ways that you could redeem that commute and either, invest during it, or enjoy it. Podcasts are a great way to redeem your commute, by going to Drive-Time University, put an audio on that will engage your mind and invest in your life while you drive, instead of spending the whole 40 minutes getting pissed at the other drivers. Other times we just get caught up in the inefficiencies of life like email, facebook, youtube, the phone, etc. Not that those things are bad, but it can take you 20 minutes or more to regain focus after an interruption or distraction. Try to minimize those interruptions by scheduling time for them, and not letting them out of that box. For example, only read and return email at 11am and 5pm for 30 minutes at a time. That way you won’t be interrupted by an email every 30 minutes. The point of these three questions is to as how balanced your life is. Life is to be invested and enjoyed, and never wasted. Many waste too much of their life, and never get ahead. Some invest too much and get too far ahead, and thus invest too little in other areas like family and friends. You need to take a sober look at how you’re spending your life. Are you wasting too much? Investing too much? Too little? Are you enjoying too little? Answer these questions honestly, and rebalanced your life as needed. If you want more information on how to be more efficient in your life and work then read the 4-Hour Workweek by Tim Ferriss. Click the link below to see it on Amazon.